People! We have some kind of news! 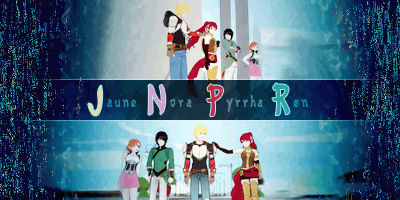 ^ Does anyone know what language is that? Hey, Tenzin has that badge thing. Is he back on the council? Rough translation of what I could read. No that's the leaf pin he was wearing in Book 2. The link isn't working for me, could you please post your translation here? Not so well, I'm afraid. Going from what I've read it seems Bolin is referring to someone (a she) as marvellous or beautiful. I guess this mean he is either referring to Korra or a new character. Perhaps another love interest? 1. ¿De verdad? ¡Es ma[ravillosa!] "She's wonderful" instead of "it's wonderful". Es is the 2nd person singular form of the verb ser (be). Verbs are gender neutral, so it's tricky to guess the gender of the noun; however, below you can find maravillosa (wonderful) which is a femenine adjective. In Spanish, nouns and adjectives must concord in gender and number. 2. Fire Rose beat me to it. I also inferred the word "impeccable" by the flirtatious context she suggested. 3. me vo[y] means "i'm going". It can also be translated to "i'm leaving", but from the context it sounds/reads like Bolin is embarrassed for what he just said and he's just going someplace else to avoid disturbance. 4. la difícil tarea de ser pa- If it's not parte de (part of), i'm sure it's padre (father), makes sense if you consider all his kids are benders. 5. Air? I'm 100% positive the whole thing reads Maestro Aire (airbender), but the first half is missing from the picture. 6. Pure context, could be take a rest, time out, a nap, etc. 7. los niños te ayud- Okay, if this sentence wants to make any sense, the full word should be ayudarán (will help). 9. demás (the rest), los demás (the others), además (also). The latter is unlikely, because it's hardly used at the end of a sentence, unless you're a poet from the XV century. Bolin is most likely gushing to Korra or Asami (The name is cut off in the image) about a date he had with a girl. Although, it could just turn out that it was a spirit messing with him. 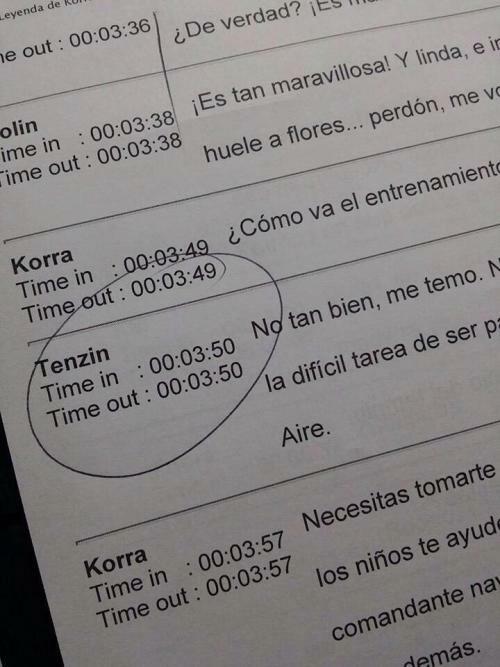 And I'm guessing Korra is talking with Tenzin about the airbending training the kids are going through (after all this is only two weeks after the end of Book 2, and it would be just like Tenzin to start up their training again as soon as they got home and everything calmed down). And the final part is most likely a naval commander, possibly being given orders about the spirits now living in the waters around the world. It seems like the the show is already being dubbed, first the Dutch trailer and now Spanish. What is Nick smoking? It was in the first interview Bryke had after Book 2's finale aired. The season is about directly dealing with the aftermath of Harmonic Convergence, Vaatu's defeat and the rejoining of the two worlds. They might be planning a general premiere in several regions instead of premiering first in the US and risk losing hype (and audience) of people living overseas to online streaming. Isn't that what happened with book two? Why are we always the last ones to see the episodes? Any one realize the lack of Mako stuff we've been getting this season? Seems like we've been getting more Bolin and less Mako, maybe roles will switch since it's supposed to be more about Earth? We got stuff from the Latin American VA's last spring as well. Dubbing takes time, so they probably aren't going to get a premiere before the US. If anything, I'd say this points more towards a fall release, yet again. Doesn't LA air the show at the same time as the US? Korra premiered on September 13 (last year) in the US, while it did on February 21 (this year) in LA. Also, the show already ended in the US, but the last two episodes haven't aired in LA yet. 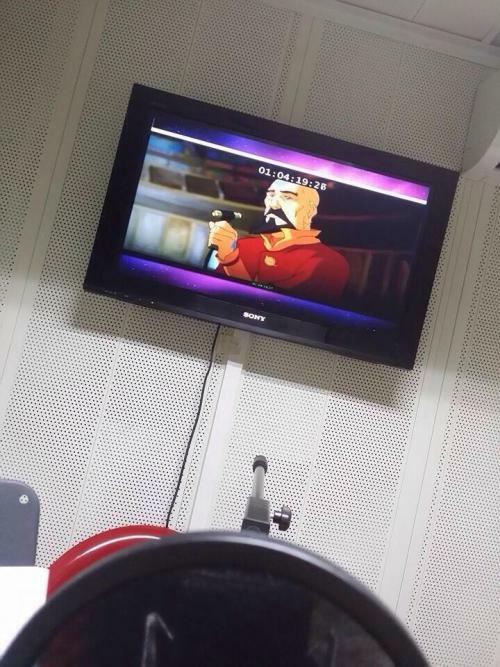 Since they're dubbing season 3 already, i doubt it's because they fell short of episodes. I think they'll air the last two episodes when they're done with season 3 so they can air it altogether. Moved to the Korra Spoilers board. According to a source, at last year's momocon, Sifu Kisu said there would be an advanced form of airbending revealed. That's the first thing that comes to mind speculating about the conversation between Korra and Tenzin. I'm obsessed with Tenzin and the airbenders, so this would be my natural conclusion. How reasonable it is, though, I can't say. 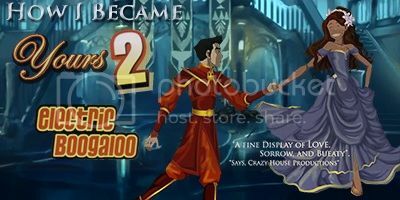 Posts regarding the Book 3 images split and merged with this thread.